Jetsun Milarepa is the best loved of all Tibet’s great yogis. His inspired instructional songs and life story of astounding faith and perseverance are far more than just sacred literature or biography. Every aspect of his life can be seen as a teaching, a manual for the path to enlightenment. And this indeed is what his life and songs have become for countless practitioners; demonstrating that the example of his devotion, diligence and ultimate achievement are of truly enduring benefit, and are as relevant to us today as they were then. 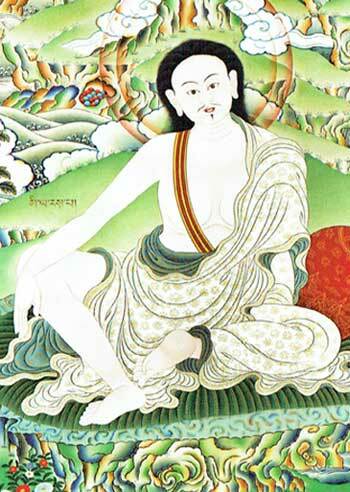 Milarepa was born in Gungthang, southern Tibet, and was given the name Thöpaga. He had one younger sister, Peta Paldron. He enjoyed a happy and prosperous childhood and his family had wealth, property, and land. However, things changed dramatically when he lost his father and his family’s estate passed into the hands of his uncle and aunt. Refusing to return the property, the uncle and aunt practically enslaved Mila’s mother and family, treating them terribly and forcing them to work the very fields they had only just lost. After suffering in this way for some time, Milarepa’s mother, consumed with despair and hatred, sent him to train in magic so that they may exact revenge on their relatives. Milarepa studied magic and spells from two different teachers, applying himself diligently to his studies. Upon learning the destructive practices he sought, he unleashed his new powers, causing the death of thirty-five people. Witnessing the diabolical nature of his actions and realising he had sown the seeds of terrible karmic consequences, Milarepa was stricken with remorse. In this dire predicament, he began to search for a Buddhist lama to help him purify his wrongdoing. He first studied with Rongtön Lhaga, though after Milarepa misunderstood this lama’s instructions, he was advised to seek out his karmic guru: Marpa. Having found Marpa, Milarepa’s training began. The trials to which Marpa subjected his new student are famous, both for their severity and their compassion. In order to purify Milarepa’s serious defilements and to secretly prepare him for the teachings he would eventually receive, Marpa ordered Milarepa to repeatedly build and then tear down a series of stone towers. This, together with seemingly endless rejection and demeaning treatment, with no sign of any teachings, eventually led Milarepa to contemplate suicide. This was the moment Marpa had been waiting for. The harsh and apparently unreasonable treatment he had shown Milarepa (even Marpa’s own wife and close students found it hard to understand) had actually been an inestimable kindness. Marpa had skilfully purged Milarepa of his karmic burden, while simultaneously preparing him to be a vessel into which he could pour the entire treasury of his teachings. Another way of viewing this period of Milarepa’s training is not so much one of purification and preparation, and more one of Marpa testing his resolve. Marpa needed a very special disciple, and a very special human being, to whom he could impart the entirety of his teachings and who would go on to bring those instructions to full ripening, thus carrying the lineage and benefitting countless beings. He needed to be sure that Milarepa had the renunciation, faith and perseverance necessary to fulfil such a daunting task. The fact that throughout his ordeals, Milarepa lost neither his faith in his Lama, nor his yearning for instruction and that he followed his Lama’s instructions without question, demonstrated to Marpa that Milarepa was indeed a suitable vessel. Thus began the next phase of Milarepa’s training. Marpa conferred upon Milarepa the full transmissions, instructions, and empowerments of Vajrayana, as well as the lineage of Mahamudra. Milarepa inherited all that Marpa had received from the Indian Mahasiddhas Naropa and Maitripa, after which he dedicated the rest of his life to realising what he had been taught. Milarepa spent years in retreat, often in wild mountainous solitudes with little to sustain or clothe him. These retreats are usually referred to as the six outer fortresses, the six inner fortresses, and the six secret fortresses. His songs from this time show how through sheer determination, faith and deeply profound practice he was able to overcome an array of seemingly insurmountable difficulties. The result of this was that his realisation blazed and all obstacles were transformed into helpers. Over time his reputation as an enlightened yogi spread and a circle of devoted disciples gathered around him, many of whom became highly realised masters in their own right. Among these, the closest disciples and the ones to whom Milarepa passed on the heart of his teachings were Gampopa (Dhakpo Lhaje) and Rechung Dorje Drakpa. In particular it was Gampopa who became Milarepa’s spiritual successor within the Kagyu lineage and who spread his tradition widely. Rechungpa’s lineage was more specifically connected with the yogic tradition of the togdens and togdenmas. Milarepa continued to teach until he was eighty-four when, upon his death, his body ascended into space amidst a host of dakinis and a mass of rainbow light. Although Milarepa’s life story and songs can be read on different levels, their true value is as a guide and an inspiration to those who would follow in his footsteps. Unlike many of Tibet’s spiritual figures, Milarepa is not portrayed as having perfect qualities from birth. On the contrary, he had been a murderer. He began his spiritual training in a situation far worse that most of us could imagine, and yet attained the supreme siddhi in one life. His is a testament to the power of the teachings and to uncompromising renunciation, tireless diligence and sincere devotion to a true lama.